Let’s get to know Jordi Ventolà, Alumnus of the Master in Marketing- Bilingual programme 2015. Jordi currently works as PM Marketing Junior for the well known Catalan firm Casa Tarradellas. His work experience began with the company Espuña and after his Master in EADA he joined the multinational Gallina Blanca. From his time at EADA Business School Barcelona, Jordi highlights its practical training, its managerial skills modules and the friendships he made. How has the master helped you in your professional career? The master helped me personally and professionally. In the personal sphere, the master provides modules that help you identify your areas of interest and focus on your strengths. In the professional sphere, the master provided me with the tools I needed to forge ahead in the mass-market Marketing sector. What are your future professional plans? I am always open to new projects but I would like to continue to move ahead in the mass-market sector. I find it really exciting when I see how the work we do is reflected in the market and helping to bring benefits to consumers. For me there are three fundamental things that made me choose EADA which are worth highlighting. “Learning by doing”- when you finish your university course you have theoretical knowledge. EADA provides you with the practical tools, which is something you don’t have. “A programme organised like a marketing plan”- the programme has been very well structured so that when you finish it, you are in a position to move on to your chosen sector without any prior experience. “Eada in Collbató”- It provides you with personal and professional growth. What difference is there with other programmes? For me the personalised attention at Collbató with the aim of improving personal and professional skills is one of the main differences with other programmes. 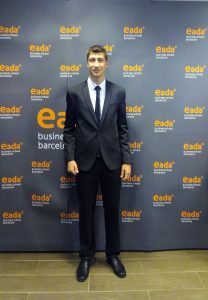 What was the most important moment during your master at EADA Business School Barcelona? There were many good moments at EADA, the stays at Collbató, my classmates, but certainly the final project was one of the best moments.